Scott Reynolds was left shell-shocked after Leighton Town blew a 2-0 84th minute lead to go crashing out of the FA Cup on Saturday. 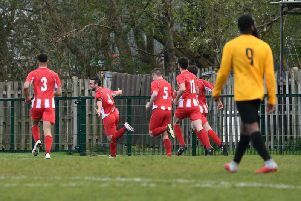 Tuffley Rovers not only overturned the deficit, but netted a winner in the seventh minute of stoppage time at Bell Close to progress past the Preliminary Round, sending the Reds out of the competition. “I’m absolutely gutted,” said Town boss Reynolds afterwards. “Words can’t explain, I was distraught. I was disappointed we couldn’t see those final minutes out. “Credit where credit is due, Tuffley put us under a lot of pressure in the last few minutes and they go home the winners. “We felt like we were going to go on to win it, 2-0 up with just a few minutes to go. “We didn’t really deal with the pressure they brought on throughout the second half. They threw a lot of direct balls at us, changed their formation and played off the big guy. James Hatch fired Leighton into the lead when Dom Marsala foreced a good save from keeper Dave Evans, only for Hatch to convert the rebound. It was a proper end-to-end FA Cup fixture and Tuffley came back at Leighton Josh Bennae forced the first save out of new Town keeper Tom Wyant. Mark Pritchett was the next after a goalmouth scramble in the Leighton box but Wyant again was there to avert the danger. Town did eventually make it 2-0 when the Tuffley defence switched off to allow Lorrel Smith the chance to tap home from close range shortly before the interval. Smith and Hatch had great chances in the second half to put a wrap on the game, as did Marsala, but Evans was keeping his side in it. With the clock ticking down, Leighton had one foot into the next round. Even when a dubious penalty was awarded to the visitors in the 84th minute, converted by Warren Mann to pull one back for Tuffley, few could have predicted the way the game would end. In almost a carbon copy of Leighton’s second, the defence switched off completely to allow Tuffley in behind, and Mark Pritchett was on hand to poke home the equaliser. Faced with a trip to Gloucestershire on Tuesday night, things went from bad to worse for Town as the visitors hit a third in stoppage time. Tuffley continued to attack and an unmarked Sam Hill was there to sweep it home into the bottom corner and pull off an unlikely comeback and head on to the next round.